Before and After photos are always the best to showcase what is possible with a can of paint! But not just any paint… we are referring to Chalk Paint® decorative paint by Annie Sloan because it is both an interior paint and exterior paint! 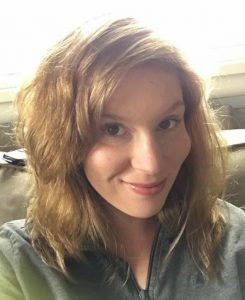 Anne, who is part of team at The Purple Painted Lady® has a young family and she and her husband Zack are serious DIYer’s. From renovating their basement, to gutting their kitchen and bathrooms…they do not shy away from any project! This is Anne…isn’t she beautiful? One smaller project she is currently in the process of doing – is giving her front entrance a face lift. Anne wanted to tone down the red of the brick. She chose Chalk Paint® in the color Old White. Old White is the quintessential color to have in your painting pantry or toolbox! It is the perfect color, in that it plays perfectly with every other color! Old White out sells every other color in Annie’s suite. NOTE though – that Old White is a very soft cream….. in my opinion. I think it looks literally like cream. Something also to note….it does have the slightest hint of yellow. Anne started with adding about 20% of water to a small portion of the Old White, but it wasn’t laying the way she wanted. So, being that Chalk Paint® is an artisan paint- she started to dip her brush straight into the paint can, brushed it directly on the brick- and then dipped her brush into a cup of water and used the damp brush to spread the paint. I would suggest doing this project on a day that the temperature is reasonable. Meaning in the 60’s, 70’s or low 80’s. Check the weather forecast to make sure no major rainstorms are expected in the next 24 hours. After that- you can have a Monsoon and not worry one bit about that paint! Start out with the paint thinned more versus less with water. Remember – you can always apply another coat of the “wash” to make the white pigment heavier. Experiment with painting some random bricks in more of a solid to give dimension. Or consider painting some random bricks using Paris Grey Chalk Paint®. You could even use the Paris Grey to cut in the mortar joints …if you have the patience. Here is the “almost” finished outcome since Anne still has the top left corner. Anne has not decorated her front stoop yet, but she always is working on different seasonal decorations to make her house a beautiful and inviting home! Once she does- we will add a final photo. 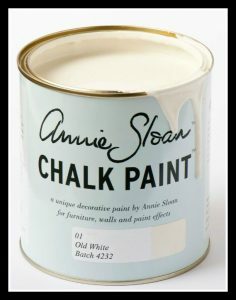 Chalk Paint®️ by Annie Sloan is also an exterior paint. Absolutely no topcoat is needed over the brick. Bricks are extremely porous and they pull that color in. As you know, chalk paint®️ sticks, grips and adheres to virtually any surface. Once it is dried and cured …..it is almost impossible to remove it. We just recommend checking the forecast before beginning a project like this and making sure that it’s not going to rain for 24 hours. * Ordering online? If you order before 3 pm EASTERN TIME any day Monday thru Friday – we will ship out your package that SAME day. We ship orders out every since week day all over the US. This entry was posted in How To and tagged exterior brick, outside, porch, wash by Tricia. Bookmark the permalink.